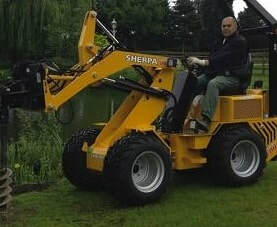 The Sherpa mini loaders are powerful machines designed to do the work where previously several machines were needed, with just one mini loader. The many mini loader attachments available will complement the excellent performance of these powerful machines. 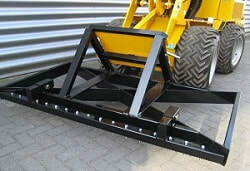 Buckets for scooping, demolition breakers for breaking concrete, earth augers for drilling, forks for lifting pallets and other materials, grapple buckets for grabbing, trenchers for digging, snow pushers for pushing snow, push brooms and roller brooms for sweeping are some of these attachments. The mini loader models 200 and 300 share the same attachments. For more information about the 150 mini loader attachments please visit the mini skid steer attachments page. Choosing the right attachments will help to reduce costs and maximise the performance of the mini loaders. Road, curbs and pavement installation and maintenance. Concrete, carpet and tile removal. Mini loader mower deck attachment. Mini loader rotary tiller attachments. Mini loader snow pusher/feed scraper. 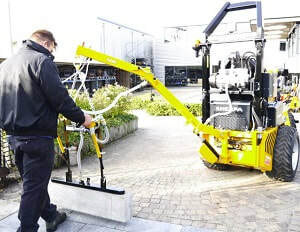 Mini loader extendable lifting arm and hooks. Mini loader mast with electric winch. Mini loader hydraulic tree grab. Designed for sweeping dirt, dried mud, debris, light snow and more from different ground surfaces, the mini loader roller broom will clean in no time. Available with bucket or without bucket attachment. 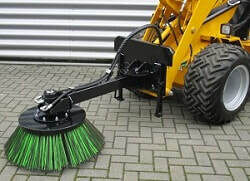 This mini loader broom attachment is designed for sweeping and brushing dirt and other unwanted materials from paved surfaces. The mini loader hydraulic weed brush is suitable for removing weeds between stones. This mini loader mower deck attachment is very effective for agricultural and gardening uses. The mini loader rotary tiller attachments are suitable for milling ground with stones and tall grass. These attachments will turn the soil over in no time at all. 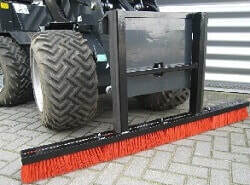 This functional snow pusher/feed scraper is designed to move animal feed, straw, silage, snow and other loose materials. The attachment is perfect for farming and agricultural projects. 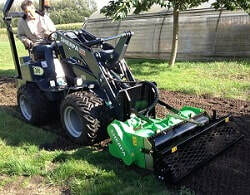 ​This mini loader attachment however, is not suitable for pushing/scraping hard objects such as wood, gravel or stone. 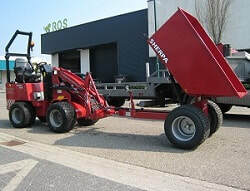 This attachments is apt for connecting trailers and other equipment to the mini loaders 100 -200 and 300 models, extending the multi functioning abilities of the mini loaders. The exclusive certificated, extendable lifting arm attachment with hoist chain will lift several loads and can be combined with stone clamps and suction cups. The mini loader ground leveller attachment is suitable for levelling sand, gravel and soil surfaces. 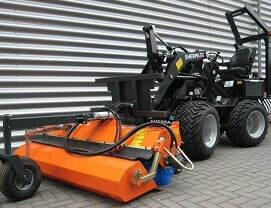 With the vertical rake, the top layer of the sand or grass plains can be loosened with effective results. Suitable for drilling holes in sandy soil and ideal for landscaping and gardening, when planting trees and digging holes for posts. A leakage pipe should be mounted onto the mini loader when using this attachment. The mini loader hydraulic breaker is perfect for building and construction industries. This hydraulic breaker will break through concrete, rock and asphalt easier than any other tool. 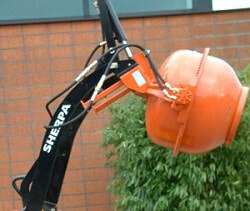 ​This powerful attachment converts your mini loader into efficient demolition machines. GlobRam RM48 including coupling plate. This curbstone-lifter attachment can be mounted onto the back of a 200 mini loader and it can be operated by walking alongside the machine. Excludes vacuum unit and sucking cup. 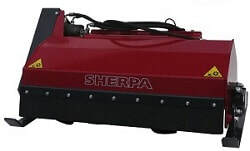 This exclusive curbstone-lifter attachment is mounted onto the back of the Sherpa 300 and is a very useful tool in the building and construction industry. With an easy to use mounting system, you can quickly install or disassemble the curbstone-lifter. A hydraulic swivel head facilitates turning and it is operable by joysticks making the mini loader easy to operate by walking alongside it. ​​Exclusive vacuum unit and sucking cup. The mini loader dumper is a great attachment for loading and transporting heavy loads of sand, rubble, soil and more. When working on construction, building, gardening or landscaping projects, this mini loader attachment will make life easier and the work less exhausting. 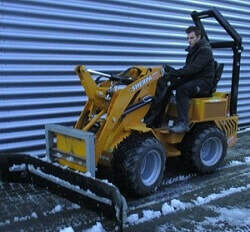 The mini loader dumper attachments are suitable for the 100 skid steer loaders as well. The mini loader concrete mixer attachment is suitable for mixing gravel, sand, cement and water into cement and/or mortar on site or transporting it to the required location. These mini loader attachments are mounted onto the mini loaders to avoid the possibility of objects falling whilst working, protecting the operator and the mini loader from accidents and damage. By placing the extra ballast block on the backside of the mini loaders you are able to lift more weight. This attachment is suitable for the 150 mini loaders. This attachment is suitable for the 200 and 300 mini loaders. These mini loader lights (08478-1-3) consist of 1 rotating light and 3 working lights already assembled. They are suitable for all the Sherpa mini loaders. The lights (08478-1-3 LED) consist of 1 rotating light and 3 LED lights already assembled. They are suitable for all the Sherpa mini loaders.